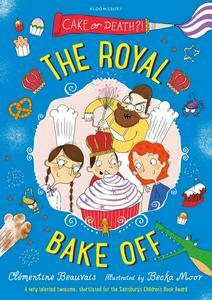 Holly, Anna and Pepino are delighted when King Steve invites them to be his kitchen assistants in an international Royal Bake Off, organised by his older brother, King Sam of Americanada. The prize money could finally make their dream come true: the intergalactic holiday of a lifetime. But the tournament is round after terrifying round of mahoosive death-defying baking, and King Steve is determined to beat his brother at all costs, even if no one prefers raisins to chocolate chips in cookies. "Two of us will have to hold the third one by his feet, head down. - What do you mean, by his feet ? Pepino asked. What if we decide to pick a girl for this ? Don’t be silly, Pepino, said Anna. Her skirt would turn over and you’d see her pants. But you’re not wearing a skirt, he observed.